I love falafels, but as I’ve been on a diet for about a hundred million years I’m not keen on deep frying them. So I came up with a baked version, now I can eat falafels everyday for the rest of my life. Thank god for that. You’ll need some sort of food processor or hand blender for this recipe, I wouldn’t try mashing them by hand, life’s too short. (Suitable for home freezing, before baking. If cooking from frozen add 5 extra minutes to cooking time. Freeze for up to 3 months). 1. Preheat the oven to 180C (160C fan). Line a large baking tray with baking parchment, spray with oil and put to one side. 2. Drain and rinse the chickpea’s and pop them in a bowl. Chuck in all the other ingredients apart from the egg and mix together. Don’t forget to season with a generous amount of salt and pepper. 4. In a separate bowl beat the egg and sprinkle a fair bit of wholemeal flour on a large plate for the coating. Season the flour with salt and pepper and then rub your hands in it. Rolling the falafels can get really messy so it’s important to dust your hands with flour after each falafel you make. 5. Roughly scoop up a tbs of the mixture and with your hands roll it into a ball. 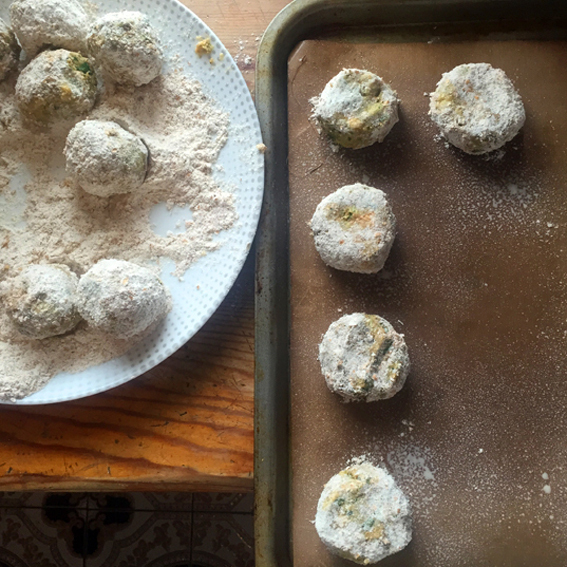 Plop your ball into the egg mixture and then roll it in the flour until evenly coated. Put to one side, rub more flour on your hands and repeat the process roughly 13 times. 6. Give your hands a quick wash and carefully arrange your falafels on the baking tray and give them a little squash down with your fingers. 7. Give the falafels another quick spray with oil, sprinkle with salt and pepper and pop them in the oven for 10 minutes. Take them out, turn over each falafel (be careful not to burn your fingers) spray with oil one last time and put back in the oven for another 10 minutes. 8. Congratulations! You’ve made falafels, you clever clever thing. What I tend to do now is freeze half the batch and put the rest into wraps and salads for my lunches. They last about 5 days in the fridge. I know what I’m making this weekend, it’s been a while since I had any. I’m guessing that I could just fry them as well? Yeah fry away, I’m just always on a diet so try not to fry my food if I can help it.